Since 1961, readers have trusted us to deliver the latest information through our magazines, newsletters, books, reports and conferences. Your satisfaction is very important to us! With knowledge being your most important tool, we provide valuable ideas to help you exceed your goals and expectations. Our role is to treat you as we like to be treated, offering quality service and products that establish us as a leader in the fields we serve. If you have questions, please don't hesitate to contact us at 800-645-8455 or at info@lessitermedia.com. Published and copyrighted by Lessiter Media, Inc., 16655 W Wisconsin Ave, Brookfield WI, 53005. All rights reserved. No part of this publication may be reproduced or transmitted in any form or by any means, electronic or mechanical, including photocopy, recording or any information storage or retrieval system, without written permission from the publisher. 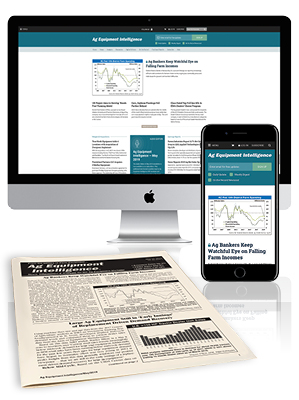 AG EQUIPMENT INTELLIGENCE is published monthly for the farm equipment industry by Lessiter Media, 16655 W. Wisconsin Ave., Brookfield, WI 53005. ©2018 by Lessiter Media. All rights reserved. Reproduction in any form of this newsletter content is strictly forbidden without the prior written consent of the publisher. Please send any address changes as soon as pos­sible to the address shown above. U.S., Canada and Mexico print subscriptions are $699 per year. International print sub­scriptions are $799 per year. Send subscription orders to: Ag Equipment Intelligence, P.O. Box 1024, Skokie, IL 60076-1024. Phone: (800) 277-1570, (847) 513-6059. Fax: (847) 291-4816. Email: aei@omeda.com. Get all things Ag Equipment Intelligence all the time! Is a Steel Glut Coming? Each monthly issue of Ag Equipment Intelligence is like getting one-on-one personal advice from the world's most trusted ag equipment industry experts. Advice that hasn't been watered down or distorted by outside influence, providing the latest and most insightful farm equipment analysis. AEI explores where the ag equipment industry is going — not just where it's been. No filler. No bias. No conflict of interest. You can access the PDF issue archive by clicking here. In this episode, we explore CNH Industrial’s steps into making 3-D printing for ag parts a reality, current and future trends in precision farming and how Dot Technology is making autonomous farming a possibility. Also in this episode, we discuss the latest earnings reports from Titan Machinery, Kubota Corp. and Art’s Way Mfg. Learn actionable sales strategies from the most influential “Dealership Minds” in the industry — of every color, size and experiences — during this one-of-a-kind event July 30-31 in Peoria, IL. You’ll discover leading dealer-to-dealer sales strategies during this 2-day networking and idea sharing event.